Famous Enterprises, Inc. is a wholesale distributor of HVAC, plumbing/PVF, building, and industrial products as well as a manufacturer of HVAC sheet metal products through its four major operating companies. MelCap acted as the financial advisor to Famous Enterprises. 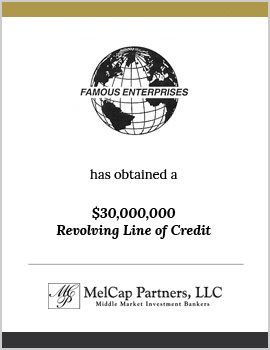 MelCap assisted the Company in obtaining a new $30,000,000 revolving line of credit from Transamerica Business Credit Corporation.